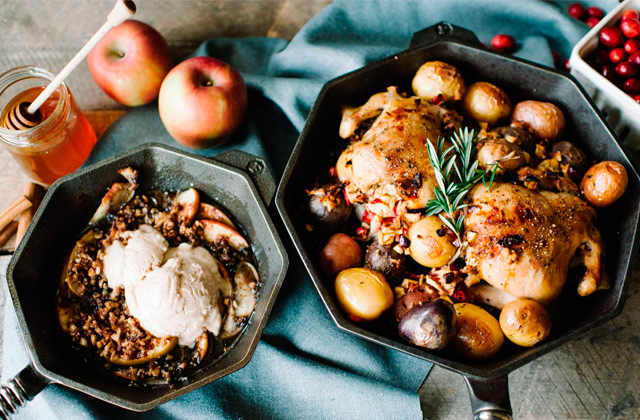 The Le Creuset griddle pan has been inspired by culinary craftsmanship. This enameled cast-iron kitchenware is a great combination of a classic form and ergonomic innovations. With its even heat distribution and superior heat retention, you can cook on low to medium heat. 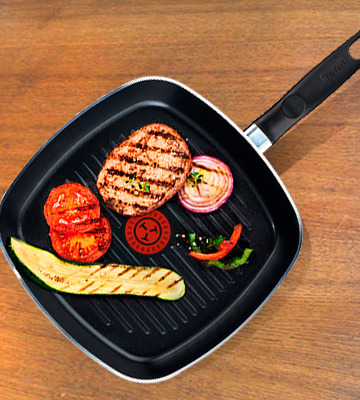 This griddle pan requires less oil usage, providing you with a healthy way of cooking food. A sturdy ridged cooking surface drains excess fat away from your food allowing you to prepare low-fat meals and stick to a healthy diet. Designed to fit all hob types, this pan can provide you with maximum versatility. This griddle pan is dual sided with one side flat and the other one ridged. 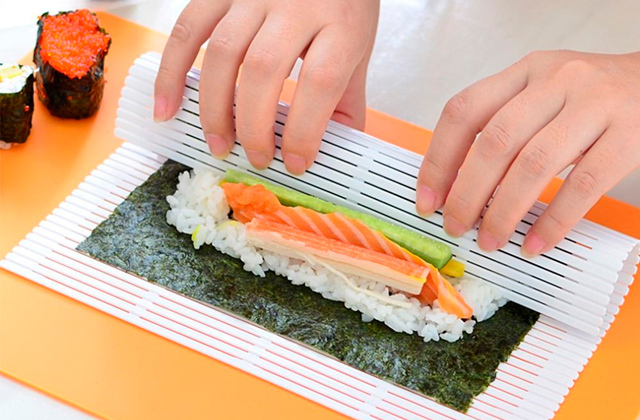 The flat side is suitable for pancakes, fried eggs, or vegetables, while the ridged side is perfect for all types of fish and meat. 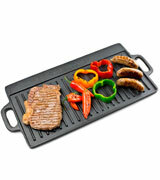 The griddle pan allows cooking thoroughly meat and fish without losing any moisture or flavour. The ridged side is a bit labor-intensive to clean. The Andrew James pan is an excellent solution for indoor and outdoor use. With a non-stick coating, large cooking surface, and 2 convenient integral handles, this nice griddle pan will surely help you diversify your grilling recipes. 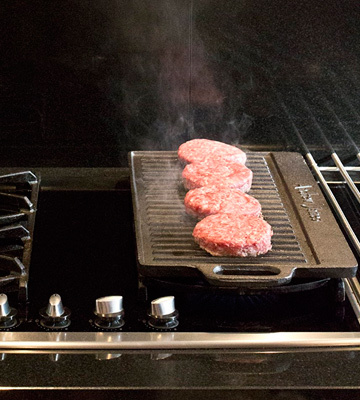 Due to a large cooking surface, the Savisto Premium griddle pan can fit a lot of food at once. The pan is compatible with all gas, induction, and electric hobs due to its universal induction base. The handle can be a bit tricky to fit at first. 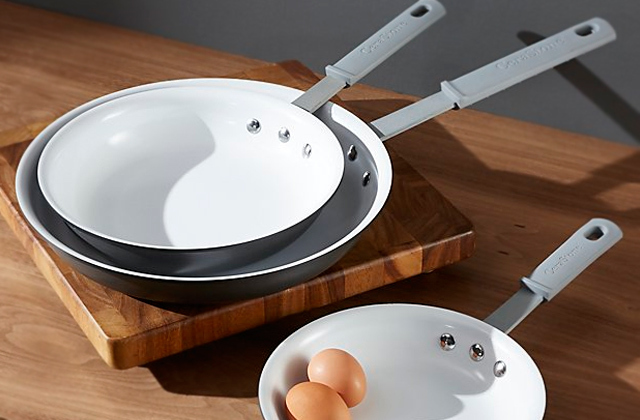 This griddle pan is a welcome addition to any kitchen and a healthy alternative to frying pans. 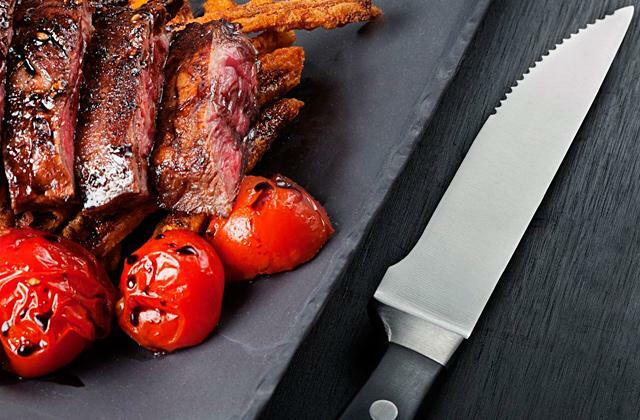 The pan provides flawless grilling performance. All dishes cooked in it come out tasty and healthy. Can be neatly stored in a drawer thanks to its detachable handle. 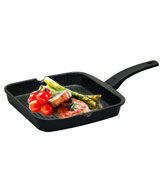 This ultra durable griddle pan features a cast aluminum core that heats up fast and evenly. Twin pouring lips allow fat and juices to be poured away and minimise spilling, so your "favourites" can be made the low-fat way. A plastic handle is a bit fragile. 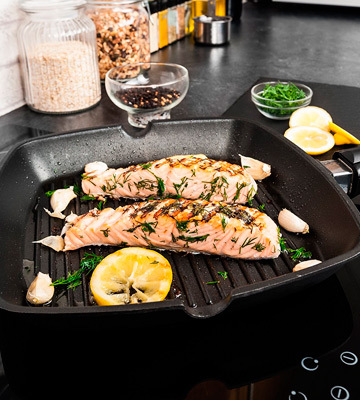 With the Prestige Stone Quartz grill pan you'll be able to enjoy a healthy cooking experience. 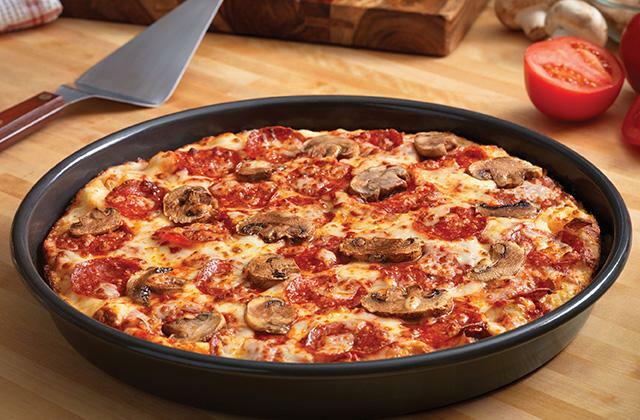 Thanks to its non-stick coating, the food in the pan doesn't stick to the bottom. It is surely one of the best griddle pans for large family households and special events, as it is quite big and can fit quite large quantities of food at a time. The Tefal Grill Pan uses a Thermo-Spot heat technology that serves as an indication telling you when the pan has reached the optimal cooking temperature and is ready to use. It also ensures that the food you cook is well done from inside out. Can be used only in stoves. 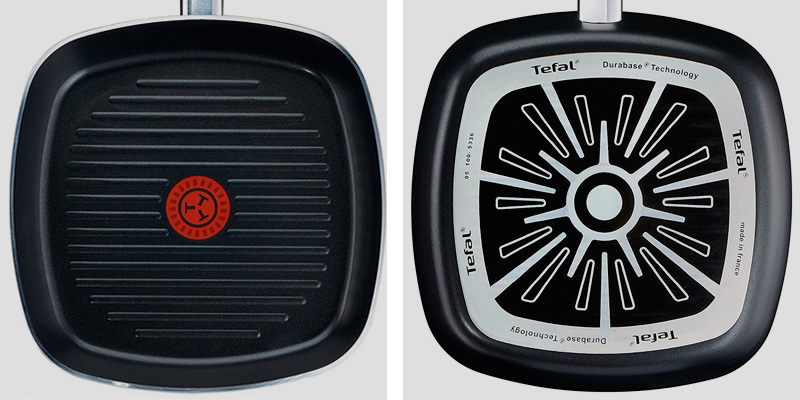 Lightweight and durable, this Tefal griddle pan is an ideal choice for everyday use. It features all the right technologies that ensure the pan will last you for years and deliver flawless non-stick performance. If you seek a healthy way of grilling meat and fish indoors, you won't find a better solution. 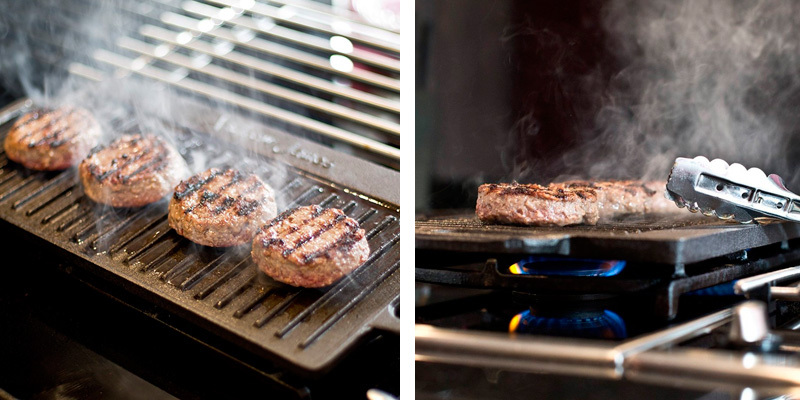 The Le Creuset griddle pan can give you a smoked flavour of an outdoor grill in the comfort of your own kitchen. 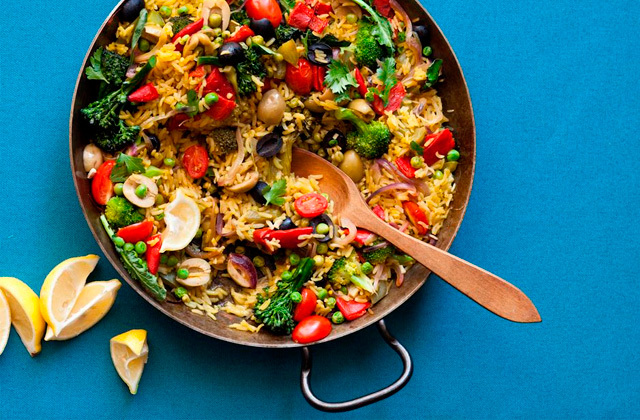 This pan requires very little oil and is perfect for cooking low-fat meals. The ribbed cooking surface drains excess fat away from your food while producing characteristic sear lines on meat and vegetables by caramelising the food surface that comes in contact with the ribs. A durable black enamel interior is easy to clean and no additional seasoning is needed. 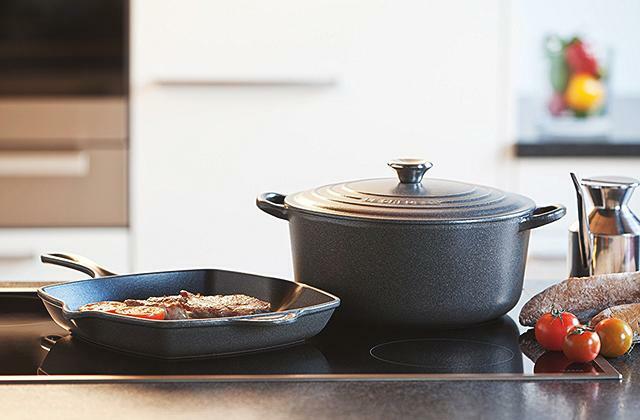 Enameled cast-iron construction ensures superior heat retention and even heat distribution for the best cooking results. You can make succulent meals, keeping moisture, nutrients, and flavours locked in. This means that whatever food you braise, stew, or simmer in the Le Creuset pan it will taste as good as you intended. An exterior enamel is long-lasting and resists cracking and chipping. 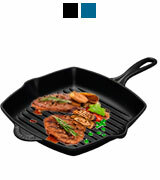 A satin black enamel interior is ideal for grilling and searing fish, meat, and vegetables. It's recommended to use low to medium heat for cooking and high heat for searing. 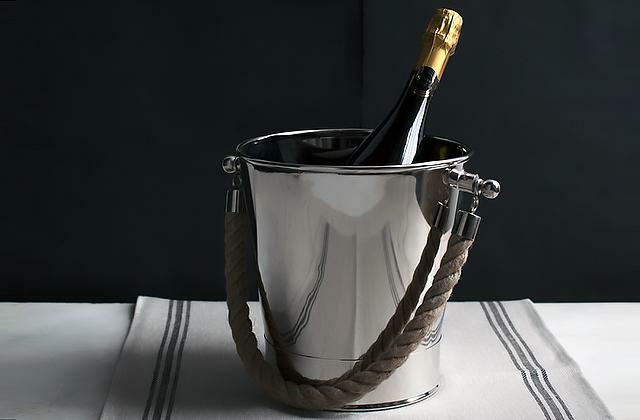 A large loop handle provides a secure grip and facilitates lifting a full pan. The pan can be used on all hob types, on the barbecue, under the grill, and in the oven, which provides maximum versatility, no matter if you choose to stir-fry, sear a steak, bake a cake, or slow cook a casserole. 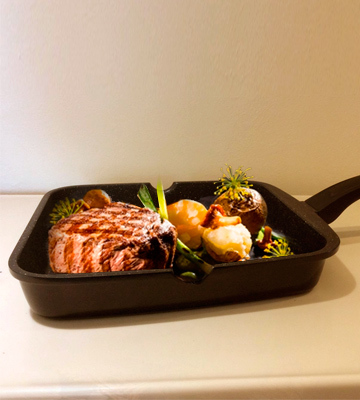 Thus, this griddle pan corresponds to modern requirements for food preparation. Would you like to cook your meal to perfection, giving it that char-grilled effect? Most foods taste better when cooked on a grill, as this brings that delicious, smoky flavour and smell to your food. 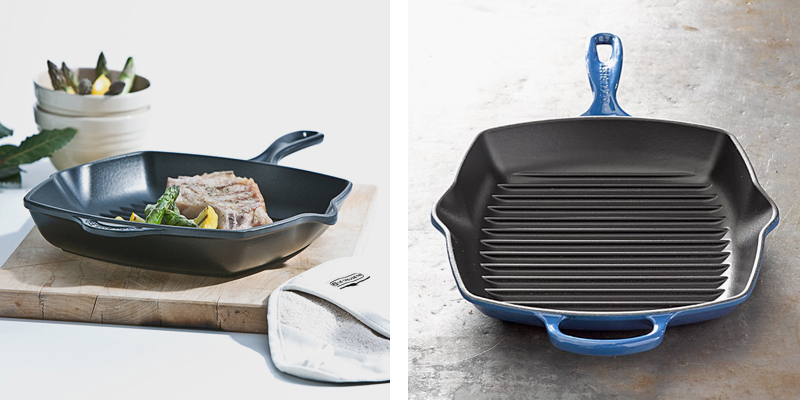 The Andrew James griddle pan is everything you need to enjoy your delicious summer inspired meal. This kitchen appliance is suitable for use on your hob or outside BBQ. The pan is made from cast iron that allows you to thoroughly cook meat and fish without it losing its moisture or flavour. The griddle pan is double-sided with one side flat and the other one ridged, so you can flip it over depending on which side you want to use. The flat side is suitable for foods like tomatoes, onions, fried eggs, mushrooms, and pancakes, while the ridged side is great for cooking all types of fish and meat steaks with delicious-looking char-grilled stripes on them. 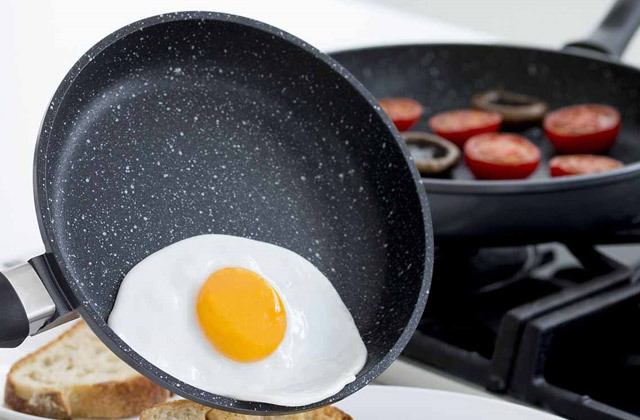 A non-stick coating makes the pan economical to use owing to its unmatched heat distribution and retention. A drip tray and channels allow excess fats and oils to run off your food for a healthier cooking experience. Health-conscious cooks will like that they can use a very little amount of oil. The integral handles are designed for safe hanging and easy lifting of the pan. A non-stick coating keeps food from sticking, making it easy to clean it without using any detergents. The griddle pan has a large cooking surface of 42 cm x 19 cm that makes it great for large family celebrations. Fancy a barbecue but it’s cold outside? We’re proud to bring you the professional-grade griddle pan from Savisto for use at home. Enjoy tasty grilled recipes in any weather all year round. The pan is compatible with all electric, induction, and gas hobs due to its universal induction base. A griddle pan is a much healthier alternative to frying in a skillet, as it has ridged griddles to drain excess fat away from your foods while cooking. A unique cutaway pouring lip lets you easily drain away excess fluid after cooking while making a clean-up of the pan a real breeze. A nonstick coating allows you to cook with minimal or without oil that increases the health benefits of your food. The deep ridges also give that smoky, char-grilled flavour to steaks, vegetables and more. Don't have enough space in your kitchen? No worries at all. The pan comes with a detachable handle that can be removed with one simple motion, allowing you to store your cookware away neatly in a cupboard. Also, it's suitable for ovens and can be used in stoves or under grills. 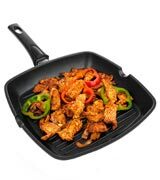 The griddle pan has a sturdy construction that allows retaining heat well without warping over time. Add this high-quality square griddle pan to your kitchen collection for the best cooking results. If you love to gather with your family to have dinner, you should definitely try this Prestige Stone Quartz pan that can easily substitute for a traditional grill allowing you to grill just about any foods in your own kitchen. 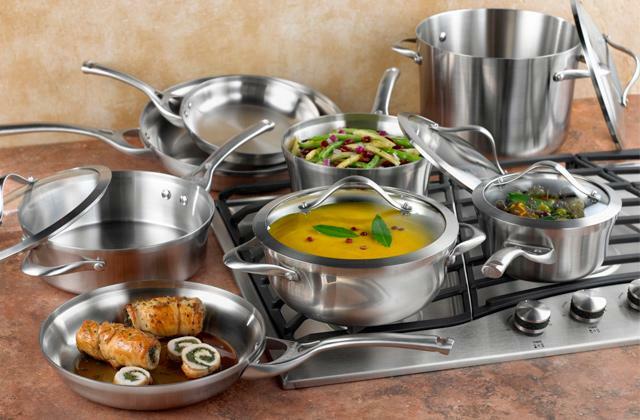 Prestige is a well-known worldwide brand of premium performance cookware and kitchen accessories. 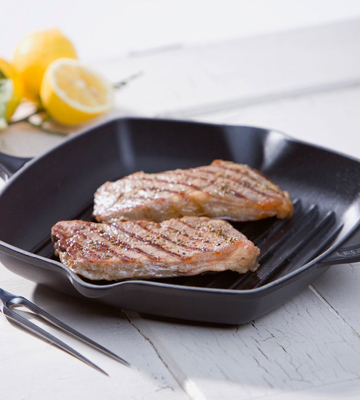 The ultra durable Prestige griddle pan is expertly designed for health conscious cooking and frequent use. The pan comes with a cast aluminium core that heats up fast and evenly. A reinforced, cream speckled non-stick inner coating is scratch-resistant and easy to clean. Twin pouring lips allow fat and juices to be poured away while minimizing spilling. So your favourites are made the low-fat way. The griddle pan leaves those appealing grill marks and a good degree of charring that imparts the characteristic grilled flavour to your steaks. A soft touch handle is specially designed for maximum safety and comfort. The pan can accommodate large quantities of food required for large family households. It’s a safe cookware option for grilling burgers, sausages, and a wide range of vegetables. The pan comes with an induction base that makes it extremely versatile and suitable for use on all kinds of heat sources like induction and ceramic cooktops, gas stoves, and electric hotplates. Even if you accurately follow recipes, you still may run a risk of undercooking or overcooking your food. With the Tefal Extra Grill Pan using an innovative Thermo-Spot heat technology, however, you should not face this problem. When the pan heats up to the optimal cooking temperature, the pattern inscribed in the center of it starts to disappear turning into a solid red spot so that you can see it's hot and ready to use. The same technology ensures that the food cooks evenly from inside out and you can get the doneness degree you want, no matter what you cook. 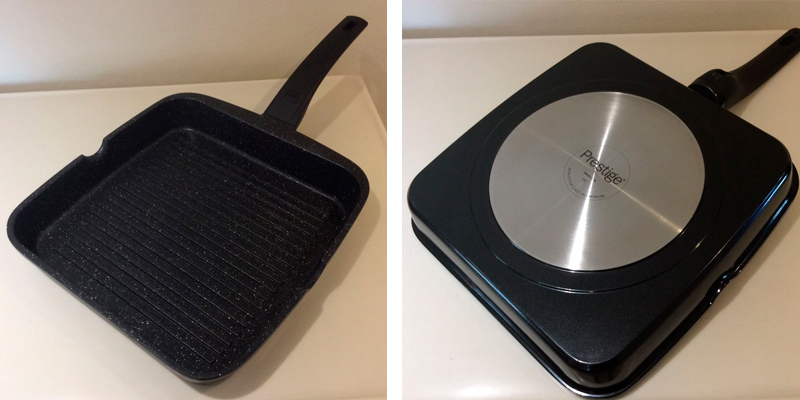 Also, the Tefal Extra Grill Pan features the Powerglide non-stick coating that not only guarantees there's an even heat transfer through the entire aluminum base but also prevents hot spots and keeps food from sticking to the bottom. The anti-abrasion layers of the pan are reinforced with mineral particles to resist scratches, while a non-stick finishing layer has a good thickness to allow its heavy use. On top of that, the pan has a non-stick PTFE exterior, making washing up a breeze. Simply wipe it clean with warm soapy water to easily remove burnt on food or pop it in a dishwasher. A bakelite handle provides a secure and comfortable grip and it’s oven safe, meaning you can start cooking on the hob and finish in the oven. 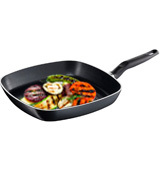 A griddle pan is a flat-bottomed pan used for searing, frying, and browning foods. It serves as a multi-purpose kitchen appliance for cooking, allowing you to bring the outdoor grilling experience to the comfort of your kitchen. 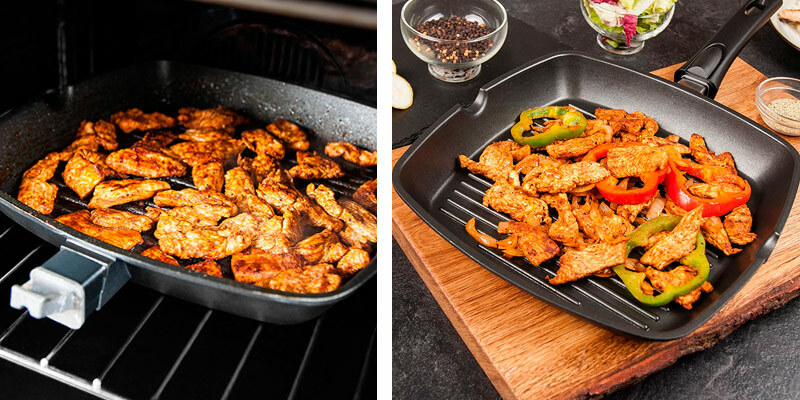 Griddle pans are a versatile solution for cooking a variety of healthy meals, from simple omelettes and pancakes to delectable steaks, burgers and chicken breasts. The best part about them all is that the food in griddle pans is stewed in its own juice and requires no fat or oil. Not all but some grill pans may come with one side flat and the other one rigid, and the deeper the ridges are the deeper and more attractive the grill marks are on the food. 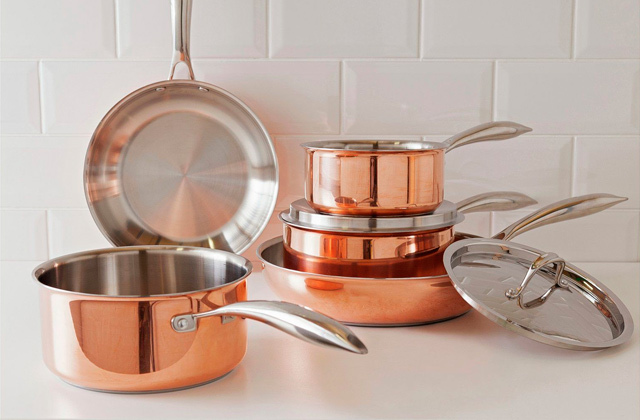 Most of these pans have a non-stick surface big enough to accommodate batches of food that needs to be cooked at a time. If you asked professional chefs what tool they couldn't be able to work without, most likely than not, you'd hear the same answer - a chef knife. 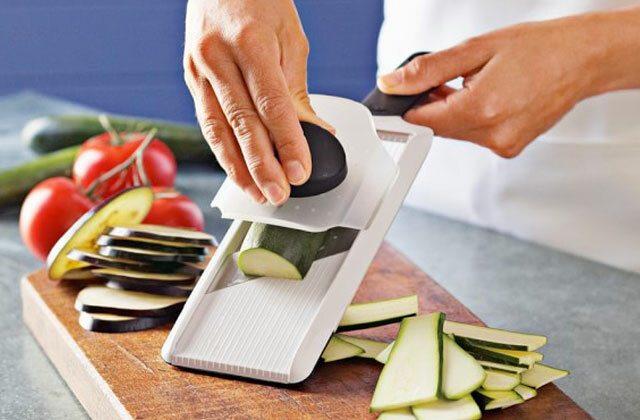 It is one of the most important tools of professional cooks designed to help speed up the cooking process, making it easier for them to chop, slice, and cut food into different sizes and shapes. 1. How to Use a Grill Pan, wikiHow. 2. How to Buy a Grill Pan, eBay. February 12, 2016. 3. Griddle, Wikipedia. August 22, 2017. 4. How to Care for Your Griddle, Campchef. October 25, 2016.